The human right to food should be put into Scots Law to protect people from rising insecurity, a report to the Scottish government suggests. The Scottish Human Rights Commission believes the move "would help tackle health inequalities". Its report was compiled for the Scottish government's consultation on making Scotland a "good food nation". The government said it was committed to protecting internationally-recognised human rights. The right to food is currently enshrined in international legislation. The commission said this right - which involves food being accessible, adequate and available for everyone - is not being realised across Scotland. 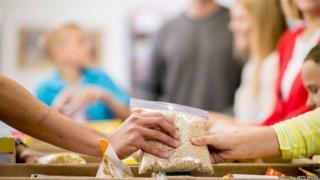 Food insecurity is "unacceptably high", the report said, with more than 480,500 food parcels being handed out by food banks between April 2017 and September 2018. It continues: "Health inequalities are persistent with many people, including children, unable to afford or access a healthy and nutritious diet." Before making its submission, the commission spoke to people experiencing food poverty in Scotland, including a mother who lives with her one-year-old son in a rural area. She said: "My universal credit was delayed and I had 85p left in my bank account. "I had run out of nappies and wipes and was worried I would have no money for milk or food for my son if it did not come through. "I had a food parcel delivered recently and I think I'll need another this week. "To reach a low-cost supermarket is a three-mile walk, making it a six-mile round trip on foot with my baby in a buggy. "To get the bus would cost me £5, which would take a significant chunk out of my weekly food budget." Commission chairwoman Judith Robertson said: "International law is clear that governments have obligations to take action to ensure people's right to food is realised. "The Scottish Human Rights Commission is calling on the government to take action to incorporate the right to food into Scotland's laws as part of its work to make Scotland a good food nation. "We want to see the Scottish government showing human rights leadership in a practical way." The consultation document states that the option of exploring a right to food which is directly enforceable under Scots law "has not been ruled out". But it suggests any proposals sit within wider human rights responsibilities. The Scottish government said a national taskforce was being established to take forward the group's recommendations. A spokesman added: "We have also increased our Fair Food Fund to £3.5m this year to continue supporting organisations that help to tackle the causes of food insecurity."